Laundry room is a comfortable and functional room intended for washing and drying clothes, taking care about wardrobe items and household things, textiles, footwear etc. 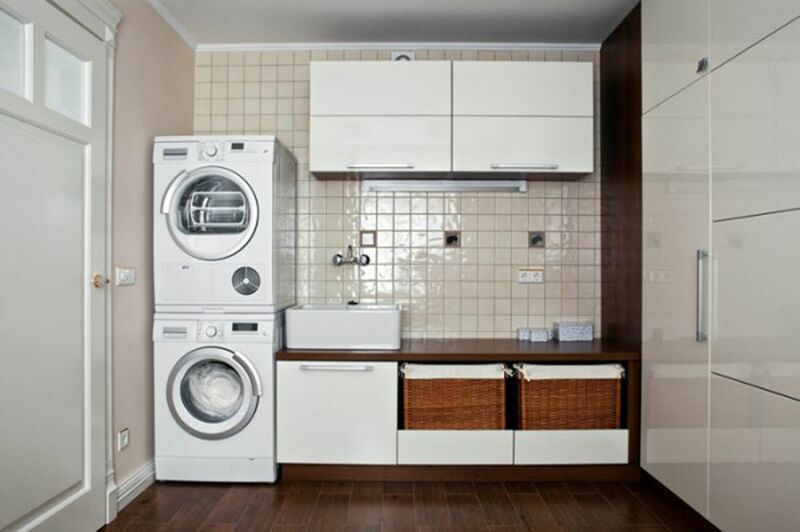 Compact but spacious laundry room in an apartment or house eases the chores of housewives. It is not only stores household chemicals and laundry basket with linen has to be washed and ironed: there also perfectly fits washer and dryer, not taking up space in the bathroom or kitchen. 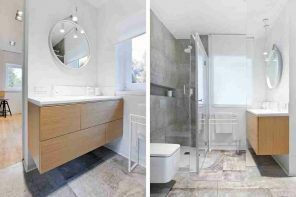 Laundry room can be created considering the planning of your apartment and the be maximally equipped for performing various home work: it is a convenient addition to the accommodation, which creates a special comfort. Interior of the rooms, created by designers will have the ideal look, blending with the concept and interior of the apartment or the house. In this operating room everything has to be located in order to the effective implementation of the main tasks of the room. Simple and comfortable furniture will allow to place accessories and household chemicals for laundry care. Furniture ergonomics should be thought over so that nothing prevented the free movement of the hostess. Laundry room in the house can be equipped with a spacious cabinet with enough place for a vacuum cleaner, cleaning tools, small stocks of needed in the household things. The laundry can be sorted on a convenient folding tabletop, have a pile of ironed clothes and home textiles. Laundry in the building and the apartment must be equipped with special baskets to store dirty laundry. Optimally to have some different baskets for light and colorful things. You should allocate areas for spreading out and hanging the washed laundry. Provide better availability of convenient and functional hangers. It is possible to equip the room with a few open shelves and boxes for little household things. It is rational to use even the doors, having on their surface capacity for household chemicals, brushes, scrapers, cleaning items. Any modern laundry in the apartment cannot be designed without washstand, which is necessary for soaking separate things. It is convenient to deal with the small stains, handle delicate textiles etc. The main attribute of the room is a reliable washing machine with no matter frontal or vertical laundry load. For frontal installation (one unit above the other) washing machine is always sets down, as it experiences more stress during the spin cycle. Popular trend in recent years is home mini “laundry center” – a special set of equipment. Washing machine and the dryer unit set on top of it in the same style, have a common control system and advanced control panel. Laundry in the private house or a large apartment always requires drying machine of tap or capacitor type in which wear can be quickly and effectively dried by circulating of hot air. Equipment for laundry involves buying an ironing board with adjustable height equipped with a stand for the iron or steam generator. Board may be mobile or stationary. If space allows, you can place a table and accessories to repair clothes, set the sewing machine there. TV and radio will make pastime in a laundry room more comfortable, especially if there is ironing board located, which implies a long presence of the housewife or the housekeeper. 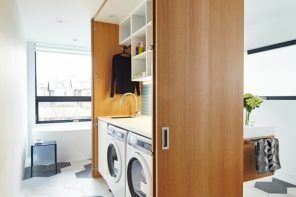 Laundry room in a private home usually equips where is adequate space for household tasks. It may be room in the heated basement, under the stairs, on the second floor or in the attic. 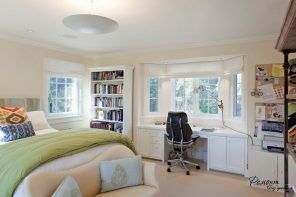 While choosing the location take into account the proximity to the water supply and communications, good ventilation system, the ability to install windows for aeration. 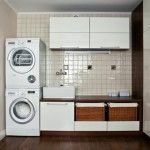 Laundry room in the apartment can be furnished in the bathroom, interior pocket or dressing room: here you need to consider the most compact arrangement of furniture and accessories for garment care. This room is not difficult to locate in the office or at the production room: choose the most remote and protected from unauthorized access premises with suitable technical conditions. Floor and wall bottoms undergoes reliable waterproofing. Also establishes a system for the main and emergency (Aquastop) outfall. 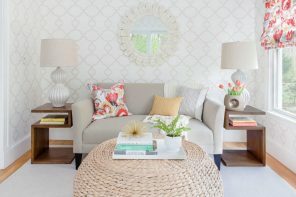 Finishing of the room must be produced from simple to care materials: it is tile or a practical, washable panels. 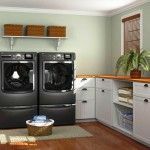 When making a laundry room in the house, take care to minimize the presence of wooden elements. Give preference to metal, plastic and tiles. Laundry room must have good ventilation and heating systems. 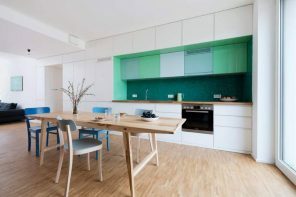 Interior of the laundry room, blending with the style of overall decoration, will be the most optimal of an apartment or a house: it may be an idea of color contrast or the use of several complementary shades, in harmony with the color of the cabinets and furniture in the laundry room. 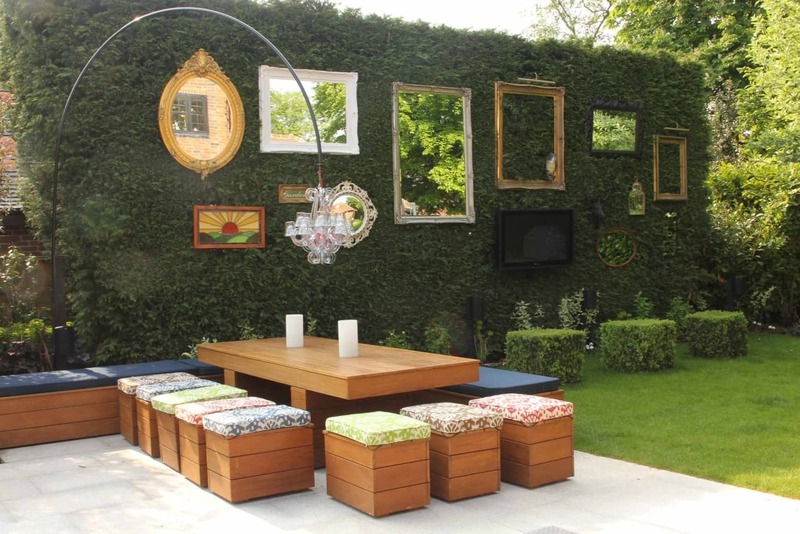 Now the building market can propose enough materials that will give the room a unique look and simplify the maintenance of the premises: the professional designers will help you to choose the best options for materials and color palette for finishing of premises. Where is the metal rack over the washer & dryer from? 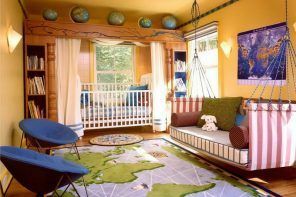 Picture has the green & yellow walls.